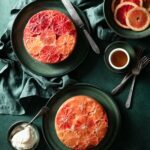 Upside Down Blood Orange Buttermilk Cakes made with a layer of fresh blood oranges and a soft coconut sugar and buttermilk cake. Preheat Oven to 350 F (175 C) Prepare two 6 inch cake pans with baking spray. Divide the 1/3 Cup of sugar between the two pans with a light even layer. Arrange the blood orange slices across the bottom of each pan. In a medium bowl hand whisk together flours, salt, and baking powder. In bowl of stand mixer, fitted with paddle attachment, beat together sugars and melted butter. Add orange zest, orange juice, and buttermilk. Mix until incorporated. Add each egg one at a time, mixing in between. Scrape bottom and sides of bowl as needed. Slowly spoon in flour mixture and mix on medium until cake batter is formed. Divide cake batter evenly between the two pans. Smooth the top of the batter with a small spatula. Bake cakes on middle to lowest rack of oven. Bake for 35-40 minutes until toothpick inserted into the center comes out clean. Place cakes on cooling rack for 15-20 minutes. Run a small knife around the edges to loosen cake from pan. Place a place upside down on cake pan, then flip over to allow cake to drop. Serve with a honey drizzle and side of whipped cream!